Chances are, you’ve heard of Richard Brand‘s work. As a partner and co-chair of the corporate group at Cadwalader, Brand has advised publicly-traded companies, private equity firms and hedge funds on high-profile matters. The list is long and impressive and includes: investor Paul Hilal’s Mantle Ridge LP in its investment in CSX Corporation and successful effort to install the late Hunter Harrison as the company’s CEO; 3G Capital in its $28 billion acquisition, together with Berkshire Hathaway, of H. J. Heinz Company; activist investor Bill Ackman’s Pershing Square Capital Management in its partnership with Valeant Pharmaceuticals International, Inc. to make an approximately $54 billion unsolicited takeover bid for Allergan, Inc.; and The Howard Hughes Corporation in a Rule 144A/Reg S offering of $800 million aggregate principal amount of senior notes and concurrent tender offer and consent solicitation for $750 million aggregate outstanding principal amount of senior notes of another series. The prolific Brand also represented D.E. Shaw & Co. in connection with its investments in EQT Corporation and Lowe’s Companies, Inc.; investors Nathan Miller and Peter O’Malley in their successful effort to replace the entire board of directors of Destination Maternity Corporation with a majority-female slate; Hudson Executive Capital in connection with its investment in Cardtronics plc; Pershing Square Capital Management in its acquisition of an 8% stake in ADP and proxy contest seeking to elect three directors to the board; Marcato Capital Management LP in its acquisition of a 6% stake in Deckers Outdoor Corporation and proxy contest seeking to elect 10 directors to the board; Ashford Hospitality Trust, Inc. in its approximately $1.27 billion unsolicited proposal to acquire FelCor Lodging Trust Incorporated; Darwin Deason in his successful effort to amend the terms of Xerox’s spinoff of Conduent; Marcato Capital Management LP in its acquisition of a 9.9 % stake in Buffalo Wild Wings, Inc. and its successful effort to elect three directors to the company’s board in a proxy contest; Pershing Square Capital Management in its acquisition of a 9.9% stake in Chipotle Mexican Grill, Inc. and subsequent agreement with the Company to add four new board members; and so on. “We are really proud to have worked on a number of significant matters that have broken new ground,” Brand says. Lawdragon: How is your practice today different from the options that existed when you started your career? The trend of practices that combine traditional corporate work with activist representation seems fairly recent. Were the two separated in the past, with different firms or practices specializing in each? Richard Brand: Law firms can move slowly in terms of adjusting to market realities. There were a number of significant corporate law firms that didn’t want to touch bankruptcy work. And then there were firms that didn’t want to touch hostile M&A work, whether it be on the bidder side or the target side. There were firms that didn’t want to represent private equity for a long period of time because of a perceived conflict with banks since private equity firms borrowed money for their acquisitions. Today there are no law firms that would refuse to take on significant bankruptcy work, there are no law firms that would refuse to represent a bidder or a target in an M&A transaction, and there are no law firms that would refuse to take on a private equity client. LD: Can we talk a bit about the recent expansion of Cadwalader’s corporate M&A practice? RB: We have one of the top M&A groups in the country in terms of experience, reputation and team composition We are extremely busy in that area. We think public M&A and private equity are extremely important practice areas and we’re completely committed to continuing to grow and develop them. Our bringing back of leading M&A partner Chris Cox after a few years in a senior corporate role and our hiring of Steve Fraidin, who is really a pioneer in the M&A world, underscores that continuing effort. LD: Can you talk a little bit about Steve’s mentorship of you in an earlier life and what that meant to you to be able to help recruit him to the firm? RB: Steve has been an incredibly important mentor to me in my career. I started working with him at Kirkland & Ellis when I was an associate. Together, we worked on probably 100 or more projects. 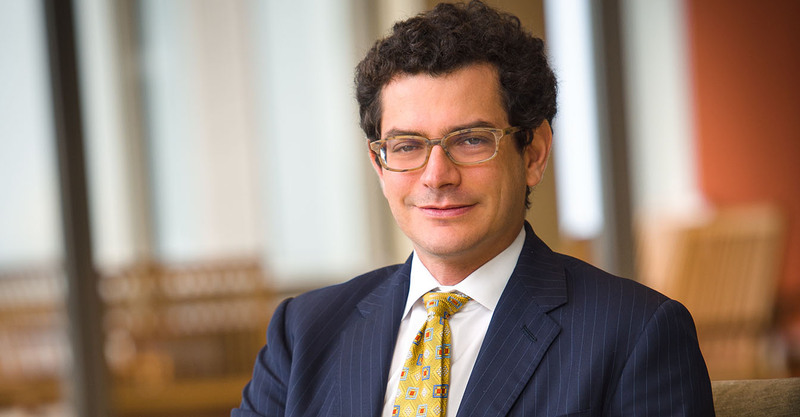 His practice is a broad practice – he tends to represent companies and private equity firms in really large transactions – and I’ve learned a ton from him. One of the things I really missed about my time working with Steve was being able to walk down the hallway and sit down on his couch and ask him questions. Being able to do that again is enormously helpful to me and to our colleagues in the corporate group, and it’s enormously helpful to the clients that we are working with. He’s a world-class dealmaker. He’s working on major matters and working with clients, rolling up his sleeves and continuing the practice that he has maintained for his career. His addition to the firm is a huge boost to our efforts to grow in M&A. LD: What do you particularly enjoy about your role as a leader of Cadwalader’s corporate practice? RB: If you’re a lawyer who wants to work in an exciting, fast-growing place where you’re working on large matters, the team is entrepreneurial, and the practice is growing, this is the best firm you could possibly be at. We’re not starting from scratch either. Cadwalader has an extremely strong reputation in the corporate world and had an incredibly strong corporate practice even before Steve and I joined. We have something very special here. LD: With all the activity of building the group and completing deals, how do you hold it all together? What is a normal day for you? RB: I’m really, really fortunate because every day is different for me. One day, I’m working on a securities offering for a Greek shipping company, the next day I’m working on a proxy contest for a high-profile activist, and then I’m working on a take-private transaction for a private equity firm. Like I said, I love my job, I love to come to work, I really enjoy what I do. LD: How do you acquire the skills to handle all the different deals that you do in a given day or a given week? RB: One thing that sets Cadwalader apart from a number of other firms is that the partners in the corporate department are generalist corporate lawyers. All of the partners in the group have experience as securities lawyers, as private equity lawyers, as public M&A lawyers and on finance matters. That’s the way that we practice, that’s the way that Cadwalader has always been. We prefer well-rounded lawyers who have a broad range of experience and can act as go-to advisers, rather than specialists in one particular area. We think that our clients are better served that way. It also comes from the way that we develop relationships with our clients. We tend to have a smaller number of clients that we do a lot for. Our relationships are broad and deep and not narrow. We have corporate clients where we do their M&A, we do their corporate governance, we help them with their securities offerings, and we help them with their finance. The firm does their litigation and their employment matters. It’s probably more expensive to train associates in that manner, because it takes more time for them to become fully versed in different practice areas. By the time they’re mid-level and senior associates, they have a broader range and are more confident in a number of areas. Clients clearly benefit from that range. We recognize that a number of other firms have gone in a different direction of having lawyers be ultra-specialized, but we think this is the right way to train our lawyers and we think this is the right way to practice law. It works very well for us and especially for our clients. LD: That’s interesting, and it goes back to the illustrations of your work that you talked about at the beginning, where you really seem to bring a broad perspective on what it is you’re helping clients achieve, whether on the activist side or on the corporate side. RB: We think it’s common sense. You’re more useful to your clients if you bring a broader range of experiences to the table. That’s consistent with our approach to activism, too. We think that if you represent a few select activists in their matters, you’re going to be more effective representing companies in responding to activists and you’ll be more effective as an M&A lawyer.